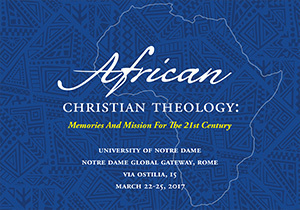 Theologians, Catholic Church leaders, graduate students and lay men and women from around Africa and North America will gather March 23-25 at the University of Notre Dame’s Rome Global Gateway for African Christian Theology: Memories and Mission for the 21st Century, a conference examining the past, present and future of African theology in the Catholic tradition. Organized by Rev. Paulinus Odozor, C.S.Sp., associate professor of Christian ethics and the theology of world Church, and the Notre Dame Center for Ethics and Culture, this gathering aims to continue the dialogue initiated by the 2001 USCCB letter “A Call to Solidarity with Africa” and examined further in 2003 and 2004 conferences hosted at Notre Dame and in Nigeria. The assembly of speakers and participants is diverse and includes four cardinals, six archbishops or bishops, four superiors general of religious orders, numerous priests and sisters and a host of theologians and members of the laity. The session topics will include moral theology, evangelization, faith and family, dialogue with African traditional religion and Islam and the engagement of Christianity with contemporary African society and culture. On the final day, five Notre Dame theology graduate students will present papers — an affirmation of and nod to the future of African theology. “We hope this conference will help to clarify and articulate the faith from an African perspective — for Africa, for the rest of the world and for our increasingly global Church,” Odozor said. Originally published by Amanda Skofstad at news.nd.edu on March 16, 2017.